In Word 2013 documents, filtering a data source excludes certain records (or, to look at it another way, it includes only certain records) on the basis of one or more criteria you specify. For example, you might want only addresses from a certain city or state to be included, or only those that match a list of certain cities or states. Filtering data excludes certain records from the merge results, but does not delete the rejected data from the original copy of the data source, so you can choose later to re-include it, or include it when using that same data set for other projects. 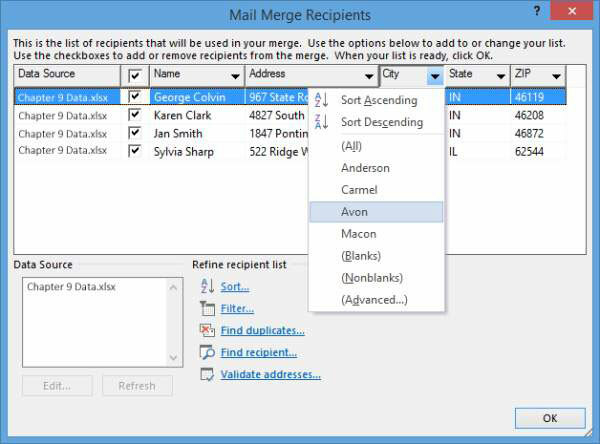 In Word 2013, choose Mailings→Edit Recipient List. Click the down-pointing arrow on the City field’s column header, choose a city (Avon for this example), and click OK. The label preview changes to show only one label. Click the down-pointing arrow on the City field’s column header and choose (All). The complete list of all four records reappears. Click the down-pointing arrow on the City field’s column header and choose (Advanced). The Filter and Sort dialog box opens with the Filter Records tab displayed. Choose City from the first drop-down list in the Field column; in the Compare To column, in the first text box, type one of your cities (Avon in this example). In the second row, choose Or from the And drop-down list; choose City from the Field drop-down list in the second row; and in the second row in the Compare To column, type another city (Carmel for the example). 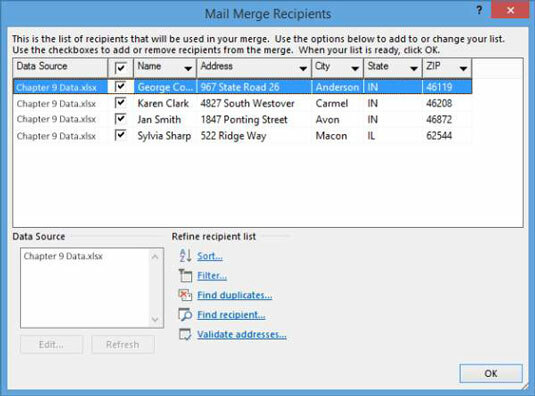 Click OK to accept the new filtering criteria and then click OK to close the Mail Merge Recipients dialog box. Two labels appear in the results: one for your first city and another for the second city.